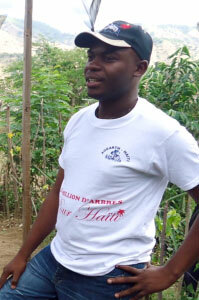 Pierre Paul returned to his native Haiti in 2010 after graduating from EARTH. There he began working as a Training Manager in Port-au-Prince with a non-governmental organization called TechnoServe, which promotes agribusiness in developing countries. The project on which he works is called Haiti Hope and is concentrated on the mango production and marketing. In his role, Pierre Paul develops and implements modules for training workshops on disease control, grafting, pruning, post-harvest processing, document management and leadership. He also has also successfully trained more than 300 people in accounting, organic certification and fair trade certification. In addition, groups of small-scale mango producers he has trained have managed to sell thousands of boxes of mangos thanks to the marketing workshops he has led. He has also encouraged the growers to rethink cutting trees for carbon and instead letting them grow. Perhaps most significantly, Pierre Paul and Technoserve have worked directly with a local bank to make loan credit available to thousands of rural people—whereas before no such credit was accessible to them. In these ways, they have helped mango producers in three regions of Haiti to increase their profits and incomes—and in this way enrich their communities. Pierre Paul has not only exemplified social and economic leadership, though; he has also collaborated with the EARTH Alumni Association-Haiti on environmental stewardship. The group hopes to plant one million trees in three different departments in Haiti. To help strengthen communities’ food security at the same time as they fix carbon, the alumni plan for many to be fruit trees. The first tree planting with a group of youth took place in the municipality of Leogane in 2011, and the group is working to continue raising funds. Pierre Paul has participated in several international contests through which he has benefited from scholarships to attend various global conferences. He served on the Youth Delegation at the 6th World Water Forum. He also represented young people at both the United Nations Conference on Climate Change in 2011 (COP17) and on Sustainable Development (Rio+20) in 2012. He dreams of someday creating a food-processing laboratory through which to add value to raw fruits and vegetables such as mangos, bananas and cassavas; he says that too many Haitian farmers lose valuable raw material because they lack knowledge of how to add value to it—a situation he wants to change. “For me, EARTH is more than a University,” he shares, “it is also the path to my success.” He especially appreciates the practical learning the Institution offered him and the love for community service it nurtured in him. Through his own work, he is helping to nurture hundreds of other people’s livelihoods, as well.